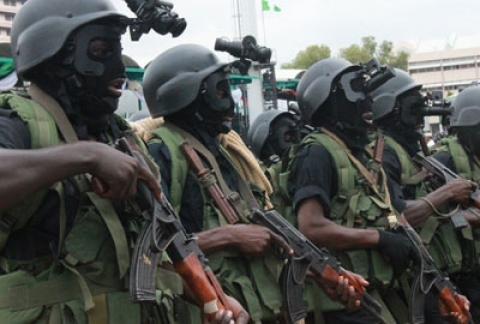 By Sadiq Umar – The Nigerian Army and other relevant security agencies have simultaneously conducted a massive Joint Show of Force (JSOF) in Abia, Anambra, Cross River, Ebonyi, Enugu and Imo States. The exercise carried out by the 82 Division of the Nigerian Army, was aimed at ensuring that security agencies in the South East Zone, jointly work as a team, to decisively and professionally deal with the complex security situations as they unfold. In his remarks to herald the commencement of the exercise, the General Officer Commanding 82 Division Maj Gen Emmanuel Kabuk stated that the JSOF is been conducted in the entire 82 Division Area of Responsibility. According to him, –“In the face of emerging security challenges and the impending general elections, the need to warn criminals, saboteurs and other trouble makers in our Area of Responsibility to stay clear becomes imperative”. “Hence, it is necessary, we occasionally and jointly conduct this exercise” he added. He further made it clear that the JSOF is not targetted at any individual or group, but is meant to send strong signal/warning that anyone who disturbs public peace will be professionally and decisively dealt with. The GOC supervised the exercise in Enugu city and environs which started at 10am on Monday the 12th of November,2018. In 14 Brigade Area of Responsibility (Abia State), troops in conjunction with other security agencies moved round for the JSOF in Aba, Araria Market, Aloji Spare Parts Market, Umuahia, Ovim, Uturu, Afara Ukwu, Arochukwu, Akanu – Bende, Amepkwu in Ohafia general Area. While troops of 13 Brigade conducted the joint exercise in Calabar Municipality, 8th Mile, Tinapa axis and major streets of the city and adjoining communities. In 34 Brigade Owerri, troops and other agencies were on the JSOF within Owerri metropolis and Okigwe general areas. In 302 Artillery General Support Regiment Onitsha, troops in conjunction with other security organizations were on the JSOF in Awka, Nnewi and Onitsha axis. Ezzangbo, Ezillo, Ishielu, Ohoazara, Nkalagu and Onicha Communities of Ebonyi State have so far witnessed the massive movement of troops of 24 Field Engineer Support Regiment and other security agencies on the JSOF. The exercise was also effectively conducted along Afikpo road and across major streets of Abakaliki township. Elements of the Nigerian Air Force, Nigerian Police Force and Operatives of the Department of State Security Services took part in the exercise. Others who actively participated in the JSOF were personnel of Security and Civil Defence Corps, Nigerian Customs Service and the Federal Road Safety Commission. So far, the Division’s Area of Responsibility has been peaceful and stable. The Army enjoined members of the public to continue with their routine activities without fear of molestation or harassment of any kind.